This book has focused on computational methods like simulation and resampling, but some of the problems we solved have analytic solutions that can be much faster. I present some of these methods in this chapter, and explain how they work. At the end of the chapter, I make suggestions for integrating computational and analytic methods for exploratory data analysis. The code in this chapter is in normal.py. For information about downloading and working with this code, see Section 0.2. Suppose you are a scientist studying gorillas in a wildlife preserve. Having weighed 9 gorillas, you find sample mean x=90 kg and sample standard deviation, S=7.5 kg. If you use x to estimate the population mean, what is the standard error of the estimate? To answer that question, we need the sampling distribution of x. In Section 8.3 we approximated this distribution by simulating the experiment (weighing 9 gorillas), computing x for each simulated experiment, and accumulating the distribution of estimates. The standard deviation of the sampling distribution is the standard error of the estimate; in the example, it is about 2.5 kg. The interval between the 5th and 95th percentile of the sampling distribution is a 90% confidence interval. If we run the experiment many times, we expect the estimate to fall in this interval 90% of the time. In the example, the 90% CI is (86, 94) kg. Now we’ll do the same calculation analytically. We take advantage of the fact that the weights of adult female gorillas are roughly normally distributed. Normal distributions have two properties that make them amenable for analysis: they are “closed” under linear transformation and addition. To explain what that means, I need some notation. Now we have everything we need to compute the sampling distribution of x. Remember that we compute x by weighing n gorillas, adding up the total weight, and dividing by n.
using Equation 1 with a = 1/n. The distribution of Z is the sampling distribution of x. The mean of Z is µ, which shows that x is an unbiased estimate of µ. The variance of the sampling distribution is σ2 / n.
So the standard deviation of the sampling distribution, which is the standard error of the estimate, is σ / √n. In the example, σ is 7.5 kg and n is 9, so the standard error is 2.5 kg. That result is consistent with what we estimated by simulation, but much faster to compute! We can also use the sampling distribution to compute confidence intervals. A 90% confidence interval for x is the interval between the 5th and 95th percentiles of Z. Since Z is normally distributed, we can compute percentiles by evaluating the inverse CDF. So if we run the experiment many times, we expect the estimate, x, to fall in the range (85.9, 94.1) about 90% of the time. Again, this is consistent with the result we got by simulation. And that’s the same answer we got before. We’ll use the Normal class again later, but before we go on, we need one more bit of analysis. As we saw in the previous sections, if we add values drawn from normal distributions, the distribution of the sum is normal. Most other distributions don’t have this property; if we add values drawn from other distributions, the sum does not generally have an analytic distribution. But if we add up n values from almost any distribution, the distribution of the sum converges to normal as n increases. More specifically, if the distribution of the values has mean and standard deviation µ and σ, the distribution of the sum is approximately N(n µ, n σ2). The values have to be drawn independently. If they are correlated, the CLT doesn’t apply (although this is seldom a problem in practice). The values have to come from the same distribution (although this requirement can be relaxed). The values have to be drawn from a distribution with finite mean and variance. So most Pareto distributions are out. The rate of convergence depends on the skewness of the distribution. Sums from an exponential distribution converge for small n. Sums from a lognormal distribution require larger sizes. The Central Limit Theorem explains the prevalence of normal distributions in the natural world. Many characteristics of living things are affected by genetic and environmental factors whose effect is additive. The characteristics we measure are the sum of a large number of small effects, so their distribution tends to be normal. MakeExpoSamples generates samples of sums of exponential values (I use “exponential values” as shorthand for “values from an exponential distribution”). beta is the parameter of the distribution; iters is the number of sums to generate. To explain this function, I’ll start from the inside and work my way out. Each time we call np.random.exponential, we get a sequence of n exponential values and compute its sum. sample is a list of these sums, with length iters. It is easy to get n and iters confused: n is the number of terms in each sum; iters is the number of sums we compute in order to characterize the distribution of sums. NormalPlotSamples takes the list of pairs from MakeExpoSamples and generates a row of normal probability plots. Figure 14.1: Distributions of sums of exponential values (top row) and lognormal values (bottom row). Figure 14.1 (top row) shows the results. With n=1, the distribution of the sum is still exponential, so the normal probability plot is not a straight line. But with n=10 the distribution of the sum is approximately normal, and with n=100 it is all but indistinguishable from normal. Figure 14.1 (bottom row) shows similar results for a lognormal distribution. Lognormal distributions are generally more skewed than exponential distributions, so the distribution of sums takes longer to converge. With n=10 the normal probability plot is nowhere near straight, but with n=100 it is approximately normal. 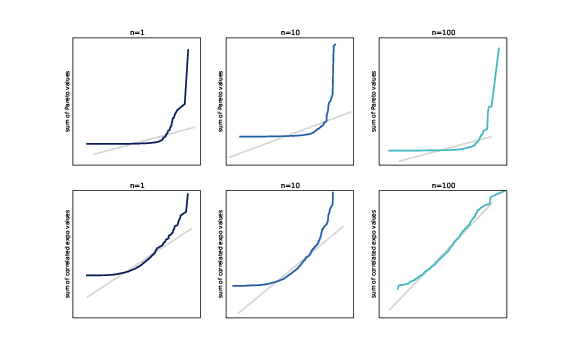 Figure 14.2: Distributions of sums of Pareto values (top row) and correlated exponential values (bottom row). Pareto distributions are even more skewed than lognormal. Depending on the parameters, many Pareto distributions do not have finite mean and variance. As a result, the Central Limit Theorem does not apply. Figure 14.2 (top row) shows distributions of sums of Pareto values. Even with n=100 the normal probability plot is far from straight. I also mentioned that CLT does not apply if the values are correlated. To test that, I generate correlated values from an exponential distribution. 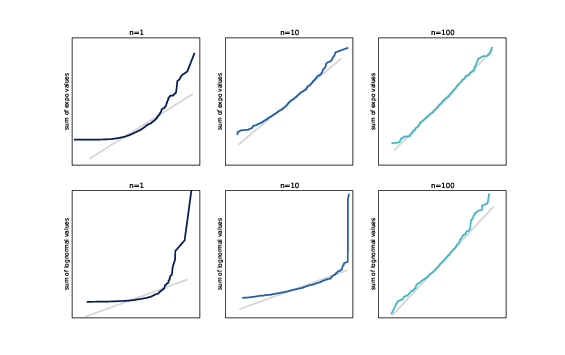 The algorithm for generating correlated values is (1) generate correlated normal values, (2) use the normal CDF to transform the values to uniform, and (3) use the inverse exponential CDF to transform the uniform values to exponential. The first value is a standard normal value. Each subsequent value depends on its predecessor: if the previous value is x, the mean of the next value is x*rho, with variance 1-rho**2. Note that random.gauss takes the standard deviation as the second argument, not variance. normal is a list of correlated normal values. uniform is a sequence of uniform values between 0 and 1. expo is a correlated sequence of exponential values. ppf stands for “percent point function,” which is another name for the inverse CDF. Figure 14.2 (bottom row) shows distributions of sums of correlated exponential values with rho=0.9. The correlation slows the rate of convergence; nevertheless, with n=100 the normal probability plot is nearly straight. So even though CLT does not strictly apply when the values are correlated, moderate correlations are seldom a problem in practice. These experiments are meant to show how the Central Limit Theorem works, and what happens when it doesn’t. Now let’s see how we can use it. Remember the logic of hypothesis testing: we compute a p-value, which is the probability of the observed difference under the null hypothesis; if it is small, we conclude that the observed difference is unlikely to be due to chance. mean and var are the mean and variance of data. We approximate the distribution of the data with a normal distribution, dist. In this example, the data are not normally distributed, so this approximation is not very good. But then we compute dist.Sum(n) / n, which is the sampling distribution of the mean of n values. Even if the data are not normally distributed, the sampling distribution of the mean is, by the Central Limit Theorem. The mean is 0, which makes sense because we expect two samples from the same distribution to have the same mean, on average. The variance of the sampling distribution is 0.0032. Which is the same because the normal distribution is symmetric. The sum of the tails is 0.168, which is consistent with the estimate in Section 9.3, which was 0.17. In Section 9.5 we used a permutation test for the correlation between birth weight and mother’s age, and found that it is statistically significant, with p-value less than 0.001.
the distribution of t is Student’s t-distribution with parameter n−2. The t-distribution is an analytic distribution; the CDF can be computed efficiently using gamma functions. ts is a NumPy array of values for t, the transformed correlation. ps contains the corresponding probabilities, computed using the CDF of the Student’s t-distribution implemented in SciPy. The parameter of the t-distribution, df, stands for “degrees of freedom.” I won’t explain that term, but you can read about it at http://en.wikipedia.org/wiki/Degrees_of_freedom_(statistics). Figure 14.3: Sampling distribution of correlations for uncorrelated normal variables. The result is the sampling distribution of r under the null hypothesis. Figure 14.3 shows this distribution along with the distribution we generated in Section 9.5 by resampling. They are nearly identical. Although the actual distributions are not normal, Pearson’s coefficient of correlation is based on sample means and variances. By the Central Limit Theorem, these moment-based statistics are normally distributed even if the data are not. We compute the value of t that corresponds to r=0.07, and then evaluate the t-distribution at t. The result is 2.9e-11. This example demonstrates an advantage of the analytic method: we can compute very small p-values. But in practice it usually doesn’t matter. One reason the chi-squared statistic is widely used is that its sampling distribution under the null hypothesis is analytic; by a remarkable coincidence1, it is called the chi-squared distribution. Like the t-distribution, the chi-squared CDF can be computed efficiently using gamma functions. 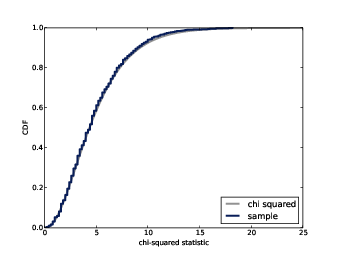 Figure 14.4: Sampling distribution of chi-squared statistics for a fair six-sided die. Figure 14.4 shows the analytic result along with the distribution we got by resampling. They are very similar, especially in the tail, which is the part we usually care most about. The result is 0.041, which is consistent with the result from Section 9.7. The parameter of the chi-squared distribution is “degrees of freedom” again. In this case the correct parameter is n-1, where n is the size of the table, 6. Choosing this parameter can be tricky; to be honest, I am never confident that I have it right until I generate something like Figure 14.4 to compare the analytic results to the resampling results. where w is adult weight, w0 is birth weight, and fi is the weight gain factor for year i. So by the Central Limit Theorem, the distribution of logw is approximately normal for large n, which implies that the distribution of w is lognormal. To model this phenomenon, choose a distribution for f that seems reasonable, then generate a sample of adult weights by choosing a random value from the distribution of birth weights, choosing a sequence of factors from the distribution of f, and computing the product. What value of n is needed to converge to a lognormal distribution? Exercise 2 In Section 14.6 we used the Central Limit Theorem to find the sampling distribution of the difference in means, δ, under the null hypothesis that both samples are drawn from the same population. We can also use this distribution to find the standard error of the estimate and confidence intervals, but that would only be approximately correct. To be more precise, we should compute the sampling distribution of δ under the alternate hypothesis that the samples are drawn from different populations. 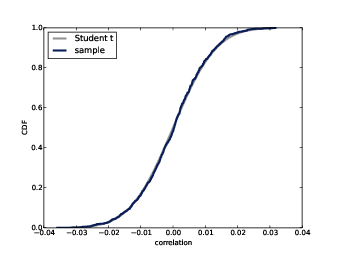 Compute this distribution and use it to calculate the standard error and a 90% confidence interval for the difference in means. Exercise 3 In a recent paper2, Stein et al. investigate the effects of an intervention intended to mitigate gender-stereotypical task allocation within student engineering teams. Before and after the intervention, students responded to a survey that asked them to rate their contribution to each aspect of class projects on a 7-point scale. Compute the sampling distribution of the gender gap (the difference in means), and test whether it is statistically significant. Because you are given standard errors for the estimated means, you don’t need to know the sample size to figure out the sampling distributions. Finally, estimate the change in gender gap; what is the sampling distribution of this change, and is it statistically significant? “Evidence for the persistent effects of an intervention to mitigate gender-sterotypical task allocation within student engineering teams,” Proceedings of the IEEE Frontiers in Education Conference, 2014.